Just paint and bake! This is one-of-a-kind art that's both fun and functional. Paint three high-quality porcelain flower pots and tray in any style—you're the artist. Full color instructions show you how to create the artistic effect you want including color mixing, brushing, sponging and more! 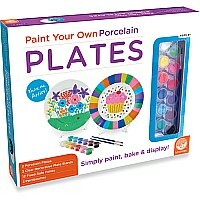 Paint and oven-bake your creations for glossy finished pieces. 3 porcelain flower pots (3.5" tall), 1 porcelain tray, 12 paints and 1 paintbrush.